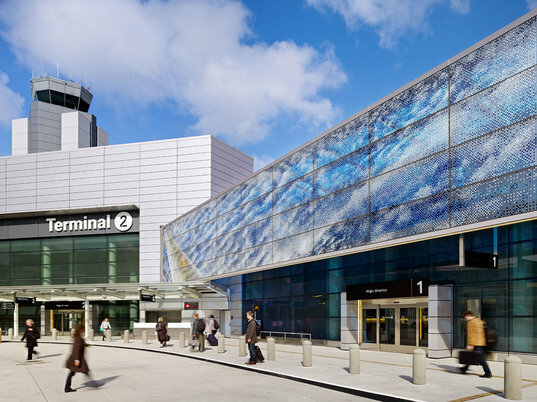 SFO’s Gorgeous New Terminal 2 Aims to Be First LEED Gold Airport Terminal in U.S.
San Francisco Airport has revealed its renovated Terminal 2, which aims to be the first LEED Gold-certified airport terminal in the U.S. Featuring 90 percent recycled building materials from the original terminal that opened in 1954, Gensler-designed SFO Terminal 2 wants to lead the way by example for other U.S. airports looking to go green. But that’s just for starters. The new terminal also wants to make travelers more comfortable while they reduce waste. Hydration Stations for refilling water bottles can be found throughout the terminal, which SFO hopes will encourage passengers to reduce waste while discovering the convenience of traveling with reusable bottles. Seating near the gates also now includes laptop plug-in stations with free wifi and children’s play areas. The terminal’s ventilation system will use filtered air while consuming 20 percent less energy. Even the food is better, and greener: SFO sources local food and encourages employees to compost food scraps to attain a zero-waste goal. And San Francisco Airport is the only U.S. airport that is an accredited museum: travelers will find local art installations throughout the terminal that are illuminated by abundant natural light. At least when our flights get delayed we have something nice to look at. With fuel prices the way they are now, how many people are still gonna be flying. Just kiddin' I don't really buy into peak oil fears, still when my flights get delayed, I ain't waiting, I would just use Jet Blue, maybe they don't have pretty airports..........So what. Wow, what a lovely idea of combining a museum into long-distance public transportation. Usually terminals are tiresome places to wait, but this should bring double the utility and to bring that even further with organic/local food and zero waste to landfill. 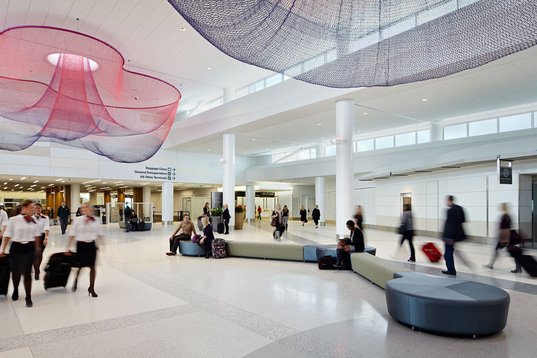 San Francisco Airport has revealed its renovated Terminal 2, which aims to be the first LEED Gold-certified airport terminal in the U.S. Featuring 90 percent recycled building materials from the original terminal that opened in 1954, Gensler-designed SFO Terminal 2 wants to lead the way by example for other U.S. airports looking to go green. But that's just for starters. The new terminal also wants to make travelers more comfortable while they reduce waste.